For other people named Chris Hayes, see Chris Hayes (disambiguation). Christopher Loffredo Hayes (/heɪz/; born February 28, 1979) is an American journalist and author. Hayes hosts All In with Chris Hayes, a weekday news and opinion television show on MSNBC. Hayes formerly hosted a weekend MSNBC show, Up with Chris Hayes. He is an editor-at-large of The Nation magazine. Hayes was born in Norwood, The Bronx, New York City, one of three sons of Roger and Geri Hayes. His mother is of Italian descent and his father is of Irish Catholic ancestry. His father moved to New York from Chicago while studying at a Jesuit seminary, and began community organizing in the Bronx. Roger Hayes spent several years leading community organizing at the Community Service Society of New York and now works as an assistant commissioner for the NYC Department of Health. Hayes's mother was a school teacher and now works for the NYC Department of Education. Hayes attended New York City's Hunter College High School, where his classmates included Immortal Technique and Lin-Manuel Miranda, and then attended Brown University, where he received a Bachelor of Arts in philosophy and worked with student theater group Production Workshop. Hayes was raised Catholic. Beginning in August 2001, for four years Hayes was a contributor to the independent weekly newspaper Chicago Reader, where he covered local and national politics. In late 2003, he began a four-year stint at In These Times, a labor-focused monthly magazine based in Chicago, where he was a senior editor. From 2005 to 2006, Hayes was a Schumann Center Writing Fellow at In These Times. From 2006 through 2007, Hayes was a Puffin Foundation Writing Fellow at The Nation Institute, and a contributing writer for The Nation. On November 1, 2007, The Nation named him its Washington, D.C. editor, succeeding David Corn. Hayes wrote extensively on issues central to the liberal community, including what ails the Democratic Party in the post-9/11 era and how the labor movement is changing. He also reported on progressive activists' work to resuscitate the "public option" during the 2009–2010 health care fight when many political insiders wrote it off as dead. Hayes was an adjunct professor of English at St. Augustine College in Chicago and a Bernard L. Schwartz fellow at New America Foundation from 2008 to 2010. Hayes guest-hosted The Rachel Maddow Show in July 2010 while Maddow was traveling in Afghanistan and later often filled in for Maddow when she was absent. Hayes has also hosted other MSNBC shows such as The Ed Show, Countdown With Keith Olbermann, and The Last Word with Lawrence O'Donnell. On November 5, 2010, MSNBC announced that Hayes would be filling in for Keith Olbermann during Olbermann's suspension. However, the network later backtracked after finding out that Hayes had also made political contributions—the issue over which Olbermann was being suspended. Hayes credits Maddow with his becoming a host at MSNBC, saying, "I absolutely would not be doing this if it weren't for her." On August 1, 2011, MSNBC announced that Hayes would host a two-hour morning show on Saturdays and Sundays, each going into depth on current issues. The first airing of Up with Chris Hayes was September 17, 2011, and featured a live interview with former speaker and current Speaker of the House Nancy Pelosi. On May 27, 2012, Memorial Day Weekend, Hayes made comments on air regarding the use of the word "heroism" as applied to American servicemen killed in action, stating, "I feel uncomfortable about the word because it seems to me that it is so rhetorically proximate to justifications for more war. And I don't want to obviously desecrate or disrespect the memory of anyone that's fallen, and obviously there are individual circumstances in which there is genuine, tremendous heroism, you know, hail of gunfire, rescuing fellow soldiers, and things like that. But it seems to me that we marshal this word in a way that is problematic. But maybe I'm wrong about that." His remark generated widespread controversy. Hayes initially defended his comment by urging people to listen to what he had actually said, Nonetheless, he apologized on his blog. Furthermore, on his June 2, 2012, show, he devoted a discussion to his comments and the disconnect between civilians and the military. On March 14, 2013, MSNBC announced that Hayes would take over the time slot formerly hosted by Ed Schultz, who would move to the weekends. At 34 years old, he became the youngest host of a prime-time show on any of the country's major cable news channels. According to The New York Times, the change was made in the hopes that MSNBC can win a wider audience than it did with Schultz. Hayes was said to transition better to The Rachel Maddow Show because he is seen as just as policy-oriented as Maddow. "Chris has done an amazing job creating a franchise on weekend mornings," said Phil Griffin, the president of MSNBC. "He's an extraordinary talent and has made a strong connection with our audience." All In with Chris Hayes, Hayes's first prime-time show, premiered Monday, April 1, 2013. The show won an Emmy in 2015 and 2018. Hayes's first book, Twilight of the Elites: America After Meritocracy was published by Crown Publishing Group in June 2012. A review in The Atlantic called it "provocative" and "thoughtful," but faulted its policy suggestions as less satisfying. Kirkus Reviews called it "forcefully written" and "provocative." Aaron Swartz described the book as "compellingly readable, impossibly erudite, and—most stunningly of all—correct." Hayes' second book, A Colony in a Nation, was published by W. W. Norton in March 2017. Hayes participated in the 2017 Brooklyn Book Festival (BKBF). In April 2017 he was a featured author at the L.A. Times Festival of Books, which took place at the campus of USC. Hayes is married to Kate Shaw, professor of law at Benjamin N. Cardozo School of Law; they met while attending Brown. His father-in-law is veteran Chicago reporter Andy Shaw. Hayes and Shaw resided in Washington, D.C., until they moved to New York City, where All in With Chris Hayes is produced. Their first daughter, Ryan Elizabeth Shaw-Hayes, was born in November 2011. Their son, David Emanuel Shaw-Hayes, was born in March 2014. Their second daughter, Anya Shaw-Hayes, was born in January 2018. Hayes' brother Luke worked on Barack Obama's 2008 and 2012 presidential campaigns. Hayes went to high school with Lin Manuel Miranda, Desus Nice, and Immortal Technique. ^ Rochlin, Margy (July 10, 2012). "Q & A With MSNBC's Chris Hayes: Pastrygate, Eating Live on TV + Who Eats Better, Dems or Republicans?". L.A. Weekly. Retrieved May 5, 2016. ^ "Chris Hayes Is Still 'All In' At MSNBC, Even As Everyone Counts Him Out". International Business Times. Retrieved November 24, 2015. 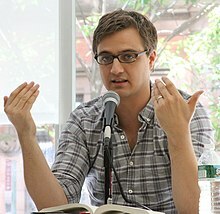 ^ a b "Meet MSNBC's Next New Host, Christopher Hayes". Alternet. June 15, 2011. Retrieved November 24, 2015. ^ Gans, Andrew (September 21, 2017). "Which MSNBC Host Directed Lin-Manuel Miranda in His First Musical?". playbill.com. Retrieved November 16, 2018. ^ Hayes, Christopher. "Articles for Chicago Reader". Retrieved January 15, 2017. ^ Hayes, Christopher. "Articles for In These Times". Retrieved January 15, 2017. ^ a b c "Chris Hayes". Retrieved January 15, 2017. ^ "Bio page at The Nation". ^ Hayes, Christopher (November 30, 2005). "Can the Democrats Win the Ground War at Home?". The Nation. The Nation Company, L.P. Retrieved April 5, 2017. ^ Hayes, Christopher (January 21, 2005). "The Fight for Our Future". In These Times. Retrieved October 10, 2007. ^ Kaufmann, Greg (February 25, 2010). "CPR for the Public Option". The Nation. Retrieved September 20, 2016. ^ "MSNBC's Chris Hayes 'Uncomfortable' With the Word Hero, Conservative Bloggers Uncomfortable With Him [Updated]". ^ Murray, Rheana (May 28, 2012). "TV host: It's hard to call dead veterans 'heroes.'". Daily News. New York. ^ "MSNBC's Chris Hayes apologizes for saying he's 'uncomfortable' calling a fallen soldier 'hero'". ^ "Chris Hayes to Take Over 8 P.M. Slot on MSNBC". The New York Times, March 14, 2013. ^ "All In With Chris Hayes Premieres on April 1 at 8 pm ET" (Press release). NBCUniversal. March 26, 2013. Archived from the original on April 3, 2013. Retrieved March 28, 2013. ^ "'All In with Chris Hayes' wins Emmy® award". MSNBC. Retrieved October 10, 2018. ^ Staff, Variety (October 2, 2018). "PBS, CBS, HBO, CNN Garner Big Wins in 39th News and Documentary Emmy Awards". Variety. Retrieved October 10, 2018. ^ "The Cult of Smartness: How Meritocracy Is Failing America". The Atlantic. Retrieved November 24, 2015. ^ "TWILIGHT OF THE ELITES by Christopher L. Hayes – Kirkus Reviews". ^ Aaron Swartz (June 18, 2012). "Aaron Swartz: Chris Hayes' "The Twilight of The Elites"". Brad DeLong. Retrieved July 16, 2012. ^ MSNBC’s Chris Hayes on His Upcoming Book, the Orlando Shooting, and Covering the Presidential Election New York, June 16, 2016. ^ Morales, Chloe (June 16, 2017). "Brooklyn Book Festival's Author Lineup Revealed". Brooklyn Patch. Retrieved June 19, 2017. ^ Kellogg, Carolyn (March 16, 2017). "The L.A. Times book festival schedule, tickets, and Innovator's Award winner announced". Los Angeles Times. Retrieved June 19, 2017. ^ "Kate Shaw staff page". ^ "Chicago was prime training ground for MSNBC's Hayes". ^ Mirkinson, Jack (August 1, 2011). "Chris Hayes MSNBC Weekend Show Announced". The Huffington Post. ^ Chris Hayes [@chrislhayes] (November 29, 2011). "I'm a daddy! Our daughter Ryan Elizabeth Shaw-Hayes was born yesterday at 8lbs 3oz. She's perfect! Mom & daughter are both doing great" (Tweet) – via Twitter. ^ Chris Hayes [@chrislhayes] (March 27, 2014). "Introducing...David Emanuel Shaw-Hayes. 8lbs of pure sweetness, born to the best mom on the planet & an awestruck dad" (Tweet) – via Twitter. ^ Chris Hayes [@chrislhayes] (January 3, 2018). "Anya is here! Her amazing superhero momma basically bent iron with her sheer will to get her out. We're so in love with her" (Tweet) – via Twitter. ^ Hayes, Chris (November 10, 2012). "A toast to the organizers". MSNBC. Retrieved December 14, 2015. ^ "Which MSNBC Host Directed Lin-Manuel Miranda in His First Musical?". September 21, 2017. ^ "Chris Hayes Confirmed the Story About Immortal Technique Bullying Lin-Manuel Miranda". December 1, 2016. 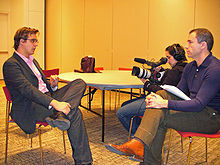 Wikimedia Commons has media related to Chris Hayes.